Summer of 2012, the only indoor court near my house was organizing a 3x3 tournament and I used it as the perfect leeway to get a good workout with a few teammates. Little did I know, I would be hooked on to this new form of basketball. Present day, 2018, though still at 10 feet, the 3x3 format has risen to new heights figuratively in this realm of urban sports. Instead of the traditional 5x5 on each side of the court, the format has three players along with one additional player acting as a substitute. The game only uses half the court. Think of 3x3 as the versatile young blood. Perhaps your Ben Simmons. Players will not only have to act as crafty ball handlers but also switch to being efficient defenders. Additionally, this type of format helps with skills such as spacing the floor and calling out quicker plays. As a result, the Youth Olympics added this format in 2010. Now, it is making its way into the biggest sporting event with the Olympics in 2020. Rapper Ice Cube and entertainment executive Jeff Kwatinetz took to the rage by establishing a lucrative league in the United States called the BIG3 featuring mostly retired players from the National Basketball Association. Financially, the league aims to give each player $100,000 once they make one of the league’s teams, with extra money available as they advance through the playoffs. Completely separate from such commercialized leagues is “The International Basketball Federation” or FIBA, which is the governing body of this format. They are strategizing to promote the 3x3 as a stand-alone sport. They would like players to dedicate their time and effort solely to 3x3 instead of transitioning from the 5x5 format. Obviously, a team with three NBA All-Stars would be phenomenal, but it would never allow 3x3 to have its own dedicated players and staff. 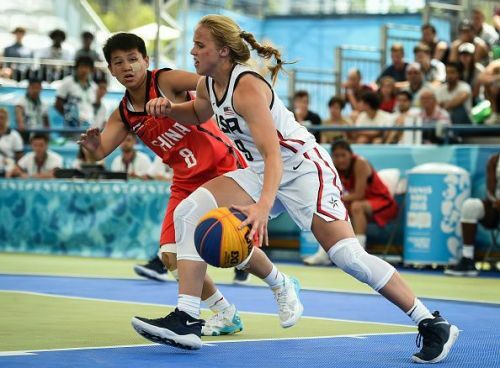 FIBA wants to grow the 3x3 format in countries with untapped Basketball upside. The way they’ve decided to play this out is by governing higher ranked 3x3 tournaments in Europe. Any team that wishes to qualify for the World Cup, will have to compete in the European circuit to gain qualification points. Rankings will also increase based on the individual rankings of the players. This means any tournament that the USA wishes to host might not be ranked as high, pushing the players to participate in the European leagues. Individual player rankings also mean that players will have to dedicate themselves to an intensive 3x3 format to qualify. Additionally, out of the 40 total spots for the World Cup (20 for men and 20 for women), 30 of those teams need to belong to different countries. For polished Basketball entities such as the US which have strong representation on both the men’s and the women’s side, this acts as a disadvantage. What could this mean in the collegiate and sports world? The question is if the goal really is to promote a new format of basketball, can we get used to watching a competition without the most competitive team in the world be a part of it? If FIBA does keep up these rules, will the US prepare a contingent to take part all year round in the European circuit? If so, does this open new opportunity for schools and colleges to award scholarships to players who will only specialize in 3x3? Another advantage for developing nations is to gather and prep only the top three to four players which is easier and more effective than preparing a roster of 12-15 players. This will not only offer competitive balance to an already existing fan base but attract new viewers to the game of 3x3 basketball and basketball as a whole. Score!